Chicago | Reuters — U.S. soybean and corn futures fell to six-week lows Monday on expectations of large U.S. crops and fears that hog disease in China might hurt demand for feed, analysts said. Chicago Board of Trade wheat futures also declined, sliding for a sixth session. CBOT November soybeans settled down seven cents at $8.48-1/4 a bushel after dipping to $8.38-1/4, the contract’s lowest since July 16 (all figures US$). CBOT December corn ended down 1-1/4 cents at $3.61-1/2 after touching $3.57-1/2, its lowest since mid-July. CBOT December wheat fell 14 cents at $5.22-1/2 a bushel after scraping $5.21-3/4, its lowest since July 20. Soybean futures fell after the Pro Farmer advisory service on Friday projected 2018 U.S. soybean production at a record 4.683 billion bushels, topping the U.S. Department of Agriculture’s forecast for 4.586 billion. Also bearish were fears that outbreaks of African swine fever in China may reduce demand for feed, including soymeal, a key source of protein in hog and poultry feed. China is home to the world’s largest pig herd. “I think this African swine fever is a concern,” said Don Roose, analyst with Iowa-based U.S. Commodities, noting soymeal futures on China’s Dalian Commodity Exchange fell nearly two per cent overnight. 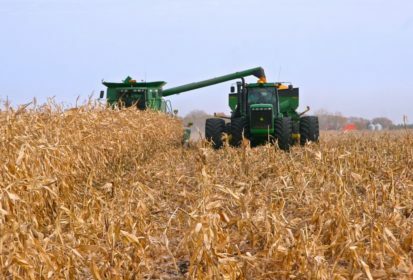 Roose said the approaching U.S. harvest added to bearish sentiment, along with weakening cash basis levels in the interior Midwest. Grain handlers there are bracing for a huge soy crop at a time when trade disputes have stalled export demand from top buyer China. After the CBOT close, the U.S. Department of Agriculture said a farm aid package would include $4.7 billion in direct payments to farmers to help offset losses from retaliatory tariffs on U.S. exports. The bulk of the payments, $3.6 billion, would be made to soybean farmers, but the package will also include payments for sorghum, corn, wheat and cotton. CBOT corn followed soybeans lower, as Pro Farmer projected a U.S. corn yield of 177.3 bushels per acre, below USDA’s forecast of 178.4 but still a record high, if realized. CBOT wheat slid on weak demand for U.S. cargoes, along with easing concerns about Black Sea supplies. Russian wheat export prices fell last week with CBOT wheat and because of a weaker rouble, analysts said. Also, the Ukrainian agriculture ministry has no immediate plan to review a memorandum this month allowing for the export of eight million tonnes of milling wheat this season, a senior ministry official said. “The market needs more bullish news — such as a pick-up in U.S. exports — to rise,” said Phin Ziebell, agribusiness economist at National Australia Bank. After the CBOT close, Egypt’s main state wheat buyer set a tender to buy wheat from global suppliers for shipment from Oct. 11-20. Results were expected on Tuesday. — Julie Ingwersen is a Reuters commodities correspondent in Chicago; additional reporting by Naveen Thukral and Sybille de La Hamaide.